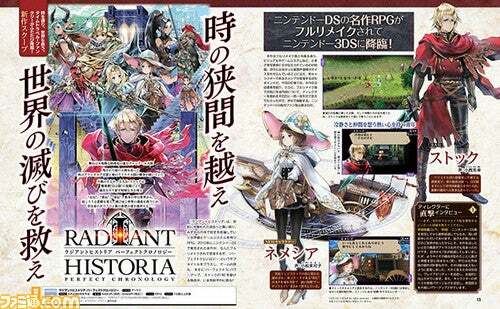 "Atlus teased a new Radiant Historia game earlier tonight, and this weekâ€™s issue of Famitsu magazine reveals it as Radiant Historia: Perfect Chronology, a full remake of the original game with new scenario on 3DS. No furhter information was revealed other than Perfect Chronology being a full remake of the Nintendo DS RPG on 3DS. Additional details including a game overview and new elements for the remake will be revealed in the magazine. Radiant Historia: Perfect Chronology releases in Japan on June 29, 2017 for Nintendo 3DS." ... if this doesn't interest you about the game, I'll tell you what will, Yoko Shimomura! She's composed the entire soundtrack for the game. Go support this remake once it releases! I completed the original at 100% and it's my favourite 2D JRPG ever. Hopefully, this one gets a European release unlike the first one since the 3DS is region-locked. Sega and Atlus agreed a publishing deal with Deep Silver to bring Atlus and select Sega games to European territories in digital and physical variants, so you longer have to be concerned about that. I'm more intrigued as to why they changed the character designs (though this wouldn't be the first time they did this, as they re-designed the characters for Trauma Centre too). I LOVE this game! I played the original to death, and really liked it's battle system. What I wonder is if they're sticking to sprite art, which looks like it. Unfortunately, judging by the Famitsu scans, it looks like they're remaking the game from the ground up. The character models are akin to Stella Glow. However, they are keeping in tradition with the portraits for character dialogue. You sure? They look the same to me. But from the size of the image, it's kinda hard to identify the difference. Most of them look the same, but who is the girl with the hat and cape? She looks brand new. The character right about Stocke in the group photo also looks new? But then, where is Eruca? Truth be told, I can't tell all that well either, but judging from the different textures of the backgrounds (against the DS version), it seems to look different. Though they may have gone with the Xenogears route in which 2D characters are up against a 3D background. The girl with the hat and cape is indeed a new character. Her name is Nemesia and she plays a key role in the new â€œSub-Historyâ€ scenario. Who's the long-haired blond girl to the left of her in the group picture then? And where is Eruca? I'm afraid the original Eruca w/ short hair is gone now. =x I personally think she looked more unique with her short hair but I think it's likely they changed it so her hair is easier to animate in the new animated opening/etc. I really liked Yoko's music in this game. By the way, this does not seem to be a remake at all. Just a port with a bonus scenario, like the Devil Survivor ports on 3DS. The graphics look identical, except slightly higher resolution and widescreen. Well, the scan seems very hard to read and understand, So I'm not pointing finger's at who's who just yet. By definition, it is a remake. Game mechanics are changed, character designs are changed and the narrative is different to that of the original. It's not technically widescreen either as the 3DS runs on standard definition. Here are clearer images from the Famitsu scan. I'm so glad that they're retaining the Pixel style. They've definitely improved the polygon count though! This is an instance of the third timeline being an option. There were originally two options here; now there are three. That doesn't mean it's a remake. We used to call that an "enhanced port". A remake implies that everything was literally remade from scratch. This is a tweaked version of the original game code, as far as I can tell. Also, it's actually widescreen. It's just not 16:9, which is the most common aspect ratio for widescreen in gaming. You can have widescreen in standard definition too (PSP is 272p, widescreen and Wii games use anamorphic widescreen at 480p). Anyway, what I'm looking forward to the most is what changes and additions will be made to the lovely soundtrack! Personally, I'm glad they stuck with the pixel style of the original. A distinction of this RPG is the fact that it harkens back to the SNES days. I'm so happy that's being retained for this remake, because when Pixel art is done right then it looks stylistically beautiful! Usually, I concede defeat when I am wrong, but this is such an informative response that I've just learned something new today. I really have to do my research for definition and re-created video game terminology. Truth be told, if the soundtrack is just rendered in a clearer file format then I'd be just as happy. Yoko's soundtrack on this game is one of the best outside of the Kingdom Hearts series, because of the freedom that the new Intellectual Property provided at the time, she was able to be more experimental. If there was no changes to the soundtrack, then I'd still be satisfied because the music in this game is just that good! I think the best example of enhanced port and remake is FINAL FANTASY VII. The HD version is an enhanced port. In terms of experience, it's the same thing, but it had to be redone from the ground, up. While FFVII Remake is a complete reconstruction of the experience from the original game. RADIANT HISTORIA Perfect Chronology falls under the enhanced port category because the experience isn't being reconstructed, but rather, complemented with a new art style, polished graphics, and new story content. And knowing how the game works, the third timeline might add a lot of gameplay time to the campaign itself. Of course, the lines can get blurred. Final Fantasy Type-0 HD is definitely not a remake as it literally uses the PSP game code as its base, but the visuals were upgraded to the point where it's almost unfair to just call it a remaster or port. It's more of a hybrid scenario. 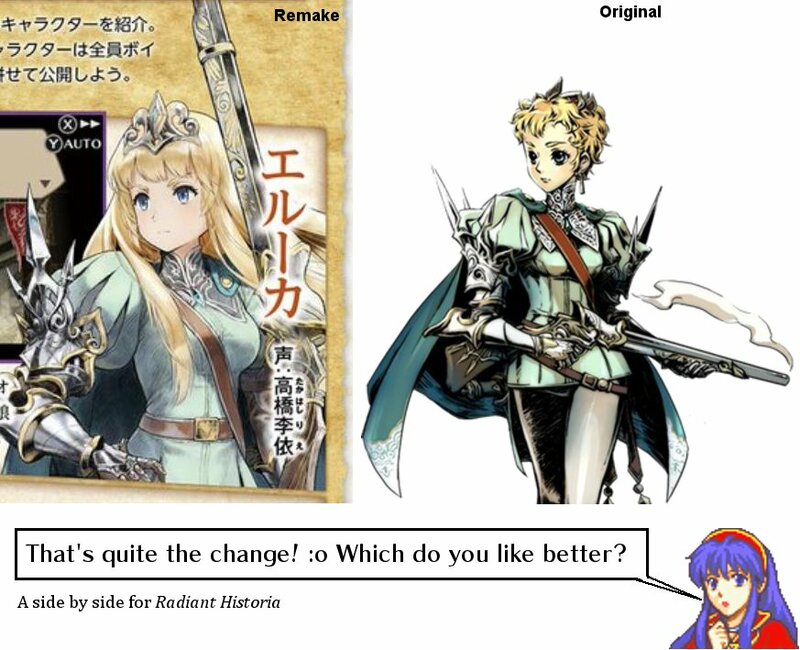 I suppose Atlus are using the term remake as a marketing ploy if nothing else. "Enhanced port" may not get as many units sold as the term remake would. I guess Atlus wants to use the Etriyan Oddessy magic in which the 3DS remakes may be the interest gauge to turn this standalone gem into a franchise. That limited edition looks so tempting, and knowing Atlus USA's love for limited edition collection, I can definitely see this coming internationally. The fact that the original DS character art and deformed chibi art is exclusive to the limited edition (for now) makes sense to gain sales for the opening month of the game. Indeed. Remake and remaster have become buzzwords in recent years. Ugh, I really don't like Eruca's redesign. She looks more younger/less mature/generic than her original design. I'm going to miss the old Eruca.